I love baking. I don't bake very often but I do every two weeks or so. I love baking some of our favorite recipes and I love trying out new recipes. At times I invite the children to help me and at times I love surprising them with the smell of a lovely cake. For me baking is therapeutic. When we do it together with the kids, it is a time for connection,too. They enjoy the process and learn lots of important life skill,too. I like preparing the ingredients. Taking the butter and eggs out of the fridge. Waiting till they reach the room temperature. Adding one egg at a time. Whisking skilfully. Being careful at every step. A reminder for slowing down. A reminder for taking my time, a reminder for being mindful. Then there is the joy: The smell coming from the kitchen. The smiles. "Mummy is baking a cake!" shouts one of the little ones. They can't wait for the cake. My daughter, Defne loves lemon drizzle cake,lemon cheese cake and cookies. Derin,like me, is a fan of chocolate.He loves chocolate chip cookies,chocolate cakes and brownies! My husband's favorite is carrot and walnut cake. I love (and always miss) my mum's plum cake. It's not easy to please everyone in this household. However, there is a crowd pleaser: Brownie. After many failed attempts at baking a brownie, several months ago I have found the perfect recipe. Finally I can make the perfect brownie! It is not like a chocolate cake,it's not like a chocolate fudge cake. It's not too sweet and not too dry. It is perfect! Crunchy on the outside and goey on the inside. Served with vanilla ice cream, everyone is happy. Even Defne, who is not so fond of chocolate, loves my brownie. Actually it is not my brownie,it is Smitten Kitchen's favorite brownie recipe. So, on World Baking Day,17th of May,I will be baking two cakes: One for our neighbour, and one for us. I am already excited about the neighbour's reaction. I planning to surprise them in the afternoon. Let's hope they will be at home! I will then share their reaction with you. 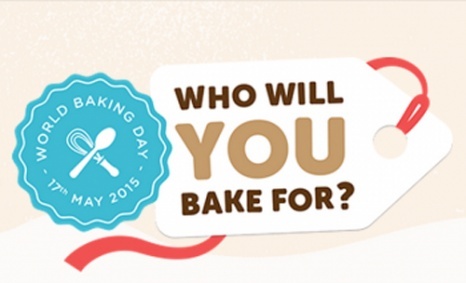 If you would like to join in with The World Baking Day and make bake your own happy cake, visit World Baking Day website . You can also follow them on Pinterest,Twitter,Instagram and Facebook. This post is sponsored by Stork.